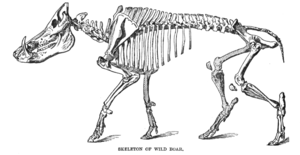 I’ve already touched on how wild boars were hunted to extinction in Britain during the Middle Ages. Before heading for the subject of boar worships, perhaps we should look a little closer at why boars are regarded as such worship-worthy beasties. Famous for their resilience, strength and courage, wild charging boars make formidable opponents. Hunters, who merely graze wild boars with their bullets, lance or spear, might find they’re being chased up a tree, mauled, trampled, squashed and even killed. The general rule is to kill the boar or be killed by it. The wild pig is blessed with very thick fur and hide, dense bones and enormous tusks (worn by males only to impress the girls), which makes it so resilient. 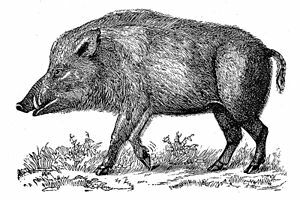 Naturally, boars were mainly hunted for their delicious meat, but they were also pursued with such relentless vigour because pigs, wild, domesticated or just ill-behaved, can cause tremendous damage to crops, kitchen gardens, fields and forests. They take being an omnivore very seriously and “hoover” up everything that comes before their snout, lizards, acorns, snails, mushrooms, carrots in a kitchen garden. There were various methods to kill wild pigs, among them pick-sticking and hunting at bay with hounds like mastiffs or trapping with nets and deep holes. While pick-sticking had at least something of the single combat, heroic element to it, hunting with dogs, shooting with guns or trapping wild boar is unmanly and a hunting method used only by cowards. During a pick-sticking hunt the hunter or spearman used a special boar spear to kill the animal, either on horseback or on “foot”, sometimes in groups of hunters but also in a single man-to-boar situation. Worshipping boar for their strength and bravery reminds me of humanity’s first foray into this misguided belief. Can we truly imbibe our enemies’ physical strength and positive traits of character? I rather doubt it. If true, we’d all be biting Buffy the Vampire Slayer’s Sarah Michelle Geller or Marilyn Monroe. It’s a fairy-tale made up by cannibals, when they clubbed each other over the head and consumed their uncles, aunts and nephews in the privacy of their own caves. A slice of Uncle Herbert, anyone? Just as there are still thousands of idiots out there who believe that bits of tiger flesh stewed with a selection of Asian herbs and spices or ground up rhino horn sprinkled over their oysters or snow leopard steaks with chips and mayo will give them greater prowess in the bedroom department, thousands of years ago Celts worshipped the boar and munched their way through thousands of these wonderful animals for rather different reasons. Even the great King Arthur himself didn’t escape the boar-magic. A story found in the Welsh/Celtic Culhwch and Olwen mentions Arthur chasing after the mythological boar Twrch Tryth and that the boar and chase had something to do with Arthur entering the otherworld or realm of the dead in order to steal a magical object. Unlike the aforementioned men with too much money on their hands and too little brain between their ears, the Celts created tiny metal boar statues to wear on their helmets and nearly life-size ones as offerings during special burials of important personages as their tribute to the boar. 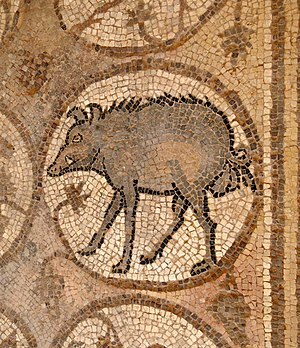 Romans were less fanatical in their boar hunting efforts, but also prized the animal for its courage and strength. Although during the 13th and 14th century noblemen mainly hunted boar for sport and food, they also practiced their martial skills on them and eventually paid tribute to their wild opponents by including them in their heraldic emblems. Because wild boars were so ferocious and often killed hounds, horse and hunter, the boar was considered a malicious animal and was even accused of having links with Satan. However, this didn’t stop the rich aristocracy to covet their cunning, strength and intelligence. My particular favourite is the noble house of Schweinichen, who used pictures of a wild boar in their heraldic emblems and colours (Schweinchen = piglet). 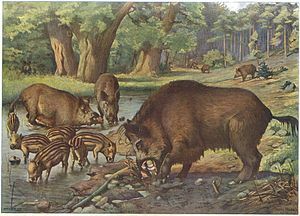 Undoubtedly, the wild boars would have preferred to be left in peace to forage in the forest rather than being hunted and then used as a cute namesake. Wild boars, like all pigs, are highly intelligent animals. Hunted to extinction in large parts of Europe, wild boars are gradually making a comeback, thanks to their astute understanding of human habits and human habitats. In Greater Berlin in Germany, populations of some 10,000 animals have been recorded, around 4,000 of which sneak into suburbs to raid bins or forage for food in gardens or to play in the municipal parks with their piglets. Knowing they are unlikely to be hunted or even chased by suburban humans, they have become so brazen that the normally nocturnal animals have been sighted during the day – when in May 2003 two wild boars went for a stroll on Berlin’s Alexanderplatz, the municipal powers ran out of patience and sent out storm troopers to deal with the trotting menace. Both intrepid piggy-tourists were shot, proving once and for all that only Stasi-swine are allowed to live happily ever after in Berlin. As per my earlier blog, wild boars have also discovered the delights of Hamburg, where earlier this year several of them invaded private gardens. These links are to German newspaper reports, showing pictures of the “humane” hunt with stun guns that merely sedated the animals. Only two of the Hamburg tourists were caught; the rest of the piggy gang escaped by jumping into the river. Totally fabby pictures and a great post. 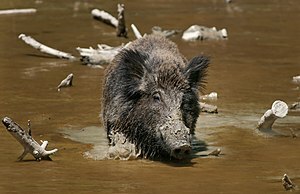 After reading that I begin to wonder if some of my Celtic ancestry has left me with a magical feeling when I look at a boar or its picture – it sounds mad but it’s the only thing I can come up with. It’s those stubbly snouts and that testosterone driven determination in their faces that’s so appealing! She giggles…. Yes, in fact, a bit like Boris Johnson swinging from a wire!